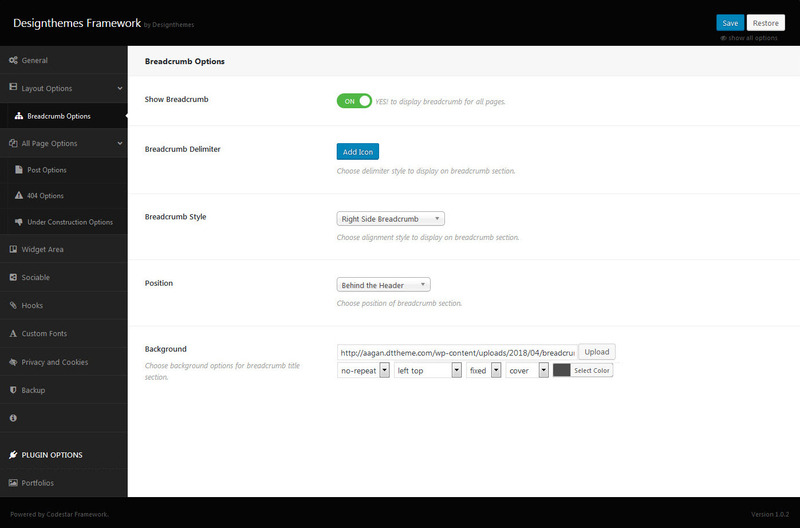 CryptApp has an advanced Framework Options panel that is loaded with options. 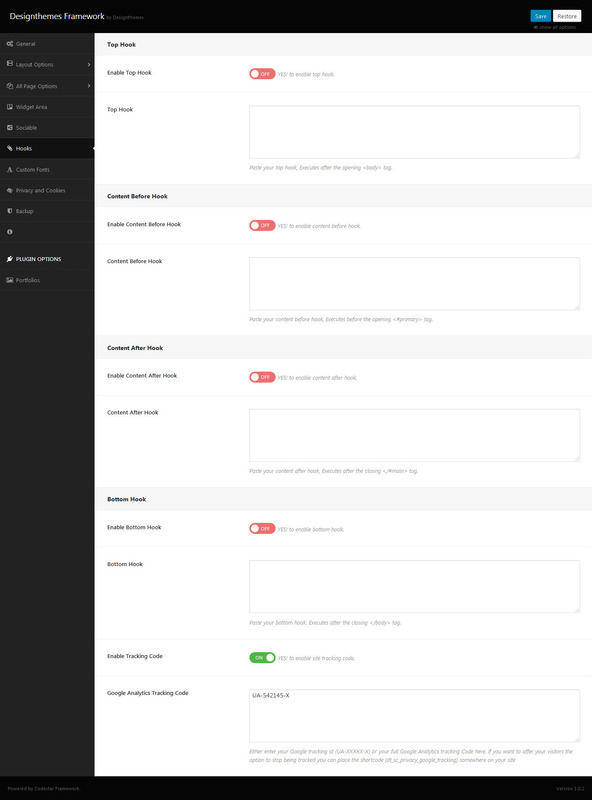 We have the options organized into logical tabbed sections, each option has a description of what it will do on the front end. Because of the sizable amount of options Aagan provides, we cannot go over them in full detail here in our documentation. We encourage you to please take some time and navigate through each tab to see what we offer. Go to Appearance > CryptApp Options in your WordPress admin dashboard to access the theme Options panel. You can also backup your theme options by clicking on the Backup tab. That is a great way to move your custom options from site to site. Site Header : Select default header. 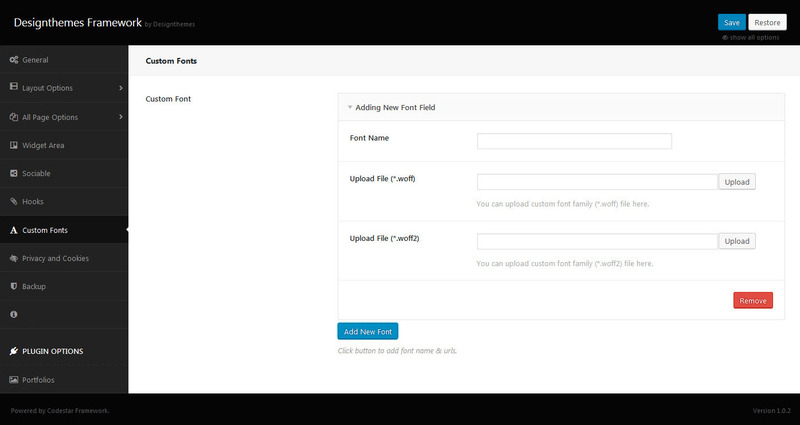 Site Footer : Select default footer. Site Loader : Enable or Disable to show the site loader. Style Picker : Enable or Disable to show the style picker in your pages. Globally Show Page Comments : Enable or Disable to show comments on all the pages. This will globally override your “Allow comments” option under your page “Discussion” settings. Show all pages in Pagination : Enable or Disable to show all the pages instead of dots near the current page. Google Map API Key : Put a valid google account API key here. Mailchimp API Key : Put a valid mailchimp account API key here. Choose a predefined theme skin, a predefined color scheme or set a custom primary color. Show Breadcrumb : Enable or Disable to display breadcrumb for all pages. Breadcrumb Delimiter : Choose delimiter style to display on breadcrumb section. Breadcrumb Style : Choose alignment style to display on breadcrumb section. Position : Choose position of breadcrumb section. Background : Choose background options for breadcrumb title section. Post Single – Here you can show / hide ‘Author Box’ (contains author details) and ‘Posts Comments’. Archives and Single Post Options – Here you control the displaying of ‘Post Format’, ‘Author’, ‘Date’, ‘Comment’, ‘Category’ and ‘Tag’. Enable Message – You can choose enable/disable for 404 message. Template Style – Choose the style of not-found template page. Custom Page – Choose the page for not-found content. Background Image – Upload an image for not-found page’s background. 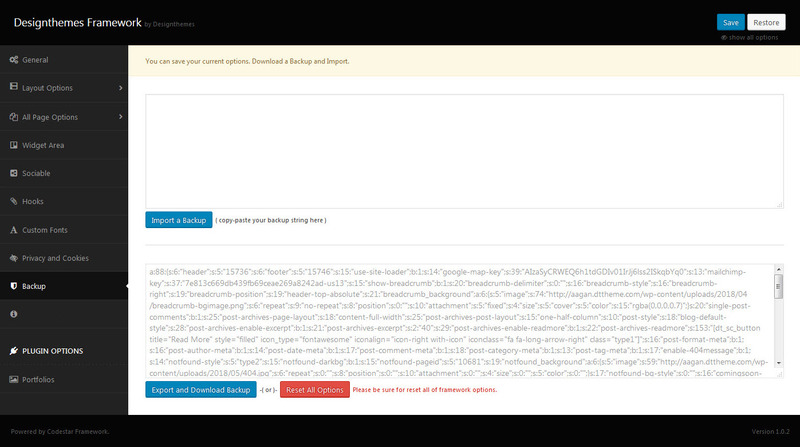 Enable Message – You can enable or disable the page content for the under construction page. Template Style – Choose the style of coming soon template.. Custom Page – Choose the page for comingsoon content. Show Launch date – Enable/ Disable to show launch date text. UTC Timezone – select the appropriate timezone. Background Image – Upload an image for coming soon page’s background. A WordPress Widget is a small block that performs a unique function. Widgets can then be added to widget-ready areas of the theme called widget sections. CryptApp has some pre-made widget sections and also allows you to create an unlimited amount of custom widget sections. You can create custom widget areas and you can assign it to any post, pages,…. Aagan includes a wide range of social icons that can be used in several locations on your site. All social icons are CSS based font icons which ensure that they are high quality, and can be configured using the available options. Continue reading below to learn more about how to set up the social icons, how to customize different settings, and how to display and integrate them. To set up social icons, right top corner, navigate Appearance > CryptApp Options > Sociable > Site Sociable and set up links for social profiles. Note: Each external link should always start with http://! 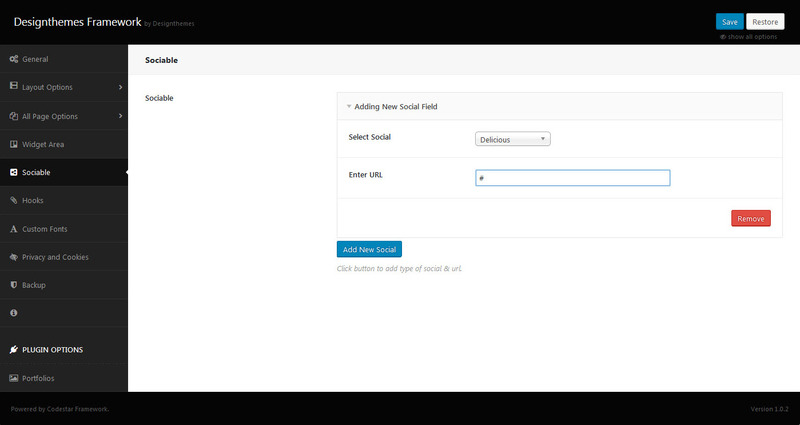 The Social Media tab in Theme Options is where you will insert your custom social media links for each network you want to display. The URL’s you enter on this tab will apply to the social icons in the header, footer or social sharing box. Hooks : Here you can add HTML content and Shortcode. Top – You can choose enable/disable for Top hook. Content Before – You can choose enable/disable for Content Before hook. Content After – You can choose enable/disable for Content After hook. Bottom – You can choose enable/disable for Bottom hook. Click Add New Font Button to add Custom font name & urls. In this tab you can customize your Privacy and Cookies option for comment form, mailchimp contact forms and login forms. You can create Cookie Consent Message with the option of Cookie Message Bar with Message, Message Bar Position. And You can create any number of buttons/links for your message bar with Add New Button option. And also you can enable or disable Modal Window with privacy and cookie info Instead of displaying the default content set custom content yourself. In case you deal with any EU customers/visitors these options allow you to make your site GDPR compliant. Cookie Message Bar – Here you can enable cookie consent message bar. Message Bar Position Here you can choose Where on the page should the message bar appear? Like Top / Bottom / Top Left Corner / Top Right Corner / Bottom Left Corner / Bottom Right Corner. Buttons -You can create any number of buttons/links for your message bar with Add New Button option. Model Window Custom Content – Here you can enable or disable Modal Window with privacy and cookie info Instead of displaying the default content set custom content yourself. Backup Options these options allow you to backup and restore your custom settings and options. These options also allow you to transfer Theme Options data from site to site. Backup Options => helps you to take backup of current Designthemes Framework settings. Restore Options => helps you to restore Designthemes Framework settings from last backup.